What is Bruxism or Teeth Grinding? Bruxism is characterized by the grinding of the teeth and is typically associated with jaw clenching which can lead to morning migraines, headaches, jaw and TMJ (temporomandibular joint) pain. It is an oral habit that occurs in most people and can be mild enough not to be a health problem. However for some, unconscious teeth clenching and grinding, either while awake or asleep, can lead to physical pain and severe dental problems. Unfortunately, people with night-time teeth grinding (bruxism) usually aren’t aware of the habit, so they aren’t diagnosed with the condition until complications occur. For this reason it is important to know the signs and symptoms of bruxism and to seek regular dental care. Cosmetically, consistent clenching can lead to the thickening (hypertrophy) of the jaw muscle (masseter) and may lead to a square jaw appearance which is not a flattering profile for woman. Treatment with Botox / Dysport can provide tremendous relief from jaw soreness, headaches, and other unpleasant problems associated with Bruxism. As well, it can soften the jawline muscle to provide a feminine appearance. 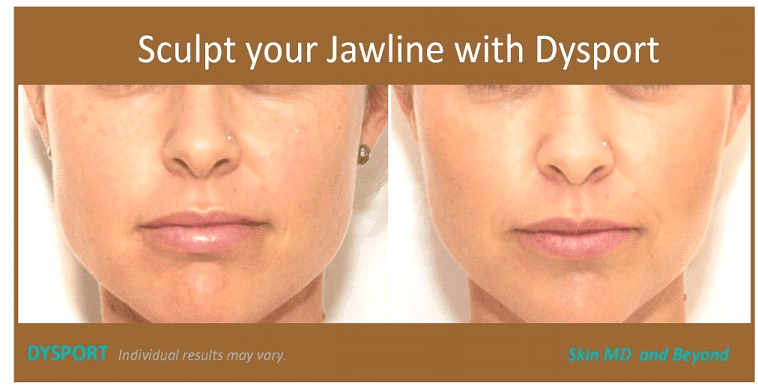 To learn more about Jawline Contouring click here. In addition to its well-publicized cosmetic uses, Botox has been approved by the FDA for painful conditions potentially related to TMJ, such as cervical dystonia and migraine. Of note, Botox is not FDA- approved for use in TMJ disorders. When doctors offer this treatment to TMJ patients, patients should be aware that this is an “off-label use” that is not approved by the FDA. A growing number of dentists are now providing Botox / Dysport treatments for their patients for both oral and maxillofacial cosmetic and therapeutic use. It has been estimated that up to 20% of North American dentists now use therapeutic Botox in their practices. Although dental devices can successfully protect teeth from damage at night for bruxism sufferers, they are ineffective in stopping the painful side effects of teeth grinding. The increasing popularity for Botox can help patients avoid being medicated with drugs such as anti-inflammatory agents, pain medications, muscle relaxants and antidepressants. Botox used for treating bruxism typically lasts for three to four months. How does Botox treat Bruxism or Teeth Grinding work? By injecting small doses of Botox directly into the masseter muscle (the large muscle that moves the jaw), the muscle is weakened enough to stop involuntary grinding of the teeth and clenching of the jaw. This significantly relaxes the muscle and reduces the wear and tear on the teeth due to grinding. Damage to the TMJ (temporomandibular joint) and headaches should be reduced or eliminated as well. Voluntary movements, such as chewing and facial expressions, are not effected at all by Botox. The procedure involves about five or six relatively painless injections and patients start feeling the effects the following day with migraines usually dissipating by the end of the first week. Injections must be repeated every four to six months but the habit is usually broken after the second treatment. Prior to any treatment, Dr. Wright will examine the face and jaw and neck. In particular, she will look at many features, such as: How large and stiff are the masseter muscles. How straight is the jawline Whether there is an asymmetry. How is the elasticity of the skin. Bruxism is thought to have a multifactorial cause, and Dr. Wright does encourage all paients to first have an evaluation from their dentist prior to Botox treatments. Causes can be classified into factors affecting the joint itself, and factors affecting the muscles and joint function. After evaluation, if there is any concern of other underlying causes/diseases you will be directed to consult your dentist prior to treatment. As TMJ patients search for alternative treatments to manage their pain, a doctor may have suggested the possibility of trying Botox injections directly into the chewing (masseter and temporalis) muscles to relax these muscles. In addition to its well-publicized cosmetic uses, Botox has been approved by the FDA for painful conditions potentially related to TMJ, such as cervical dystonia and migraine. Of note, Botox is not FDA-approved for use in TMJ disorders. When doctors offer this treatment to TMJ patients, patients should be aware that this is “off-label use” that is not approved by the FDA. The FDA has not evaluated the safety or efficacy of this powerful neurotoxin for TMJ pain treatment. Adding to the uncertainty about whether to pursue treatment of TMJ pain with Botox , clinical trials published so far have been small and have produce inconsistent findings. Before we ask whether Botox can help reduce your TMJ pain, we need to ask a more basic question: Is it safe to use Botox this way? When injected into muscles, Botox causes a partial paralysis of those muscles. The paralysis changes the forces causing normal stress on the TM joint. These forces are considered necessary to maintain the usual process of breakdown and regrowth of bone. If the paralysis changes bone remodeling in the TMJ area, injection of Botox into the chewing muscles might cause unique safety concerns and unknown long-term problems. With the cooperation of the TMJ Association, Dr. Karen Raphael and colleagues at New York University posted an online survey on the Association’s website, to identify women who had received TMJ injections in their chewing muscle and a similar group of TMJ patients who did not. Among the 150+ women who completed the survey, as published in the May 2014 issue of the Journal of Oral Rehabilitation, 7 women who had been treated with Botox for their TMJ pain and 9 matched women who had never received Botox underwent specialized radiological imaging of their TMJs. The images were evaluated by oral and maxillofacial radiologists who did not know their treatment history. The radiologists found abnormally low bone density in the TMJ area in all of the women treated with Botox and in none of the women who did not receive Botox .